A $100 Trillion Global Energy Internet by 2050? Abolishing fossil fuel subsidies and taxing carbon emissions can fund construction of a world-spanning energy internet by 2050. Existing proposals for cross-border electricity interconnections will — over time — merge into a global energy internet following the pathways blazed by fiber optic cables. In assessing the potential, consider just two numbers. The first: fossil fuels subsidies amount to $5.3 trillion, according to the International Monetary Fund. The second, all the needed technologies to solve climate change (apart from carbon capture and storage) can be implemented for carbon prices of $40 per tonne or lower, according to global management consultancy McKinsey. Applying $40 carbon prices to all the world’s 40 billion tonnes of carbon emissions would generate $1.6 trillion a year. Eliminating fossil fuel subsidies and applying $40 carbon pricing, therefore, will raise $6.9 trillion a year for reinvestment. That’s more than 8% of the global economy. Economic savings from eliminating fossil fuel subsidies can be redeployed to investment in new globe spanning energy infrastructure across which zero emission energy can flow. All of this amounts to the biggest ‘virtuous circle’ the world has ever seen. Fixing climate change is no longer a technology problem. It’s an economic and financial reform problem. 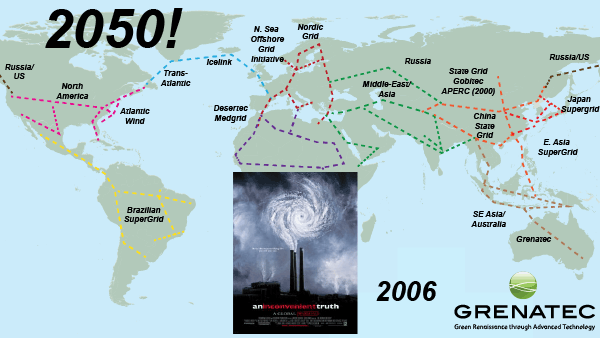 Perverse economics (unpriced or subsidized carbon) caused climate change. Reformed economics can fix it. The benefits extend beyond climate change. The global proportion of the aged is growing. Pensions and social security programs are underfunded. Large-scale investment funding in decarbonization paid for by carbon market reform can generate the needed cash flows for low emission infrastructure investment. This investment will then generate the income streams needed to pay the costs of an aging population. By 2050, the can be connected by a series of hub-and-spoke power line and pipeline networks across which electricity and hydrogen — each fungible into the other — will flow. This process will occur in three stages. The first is deepening, broadening and upgrading national electricity grids to enable more long distance inter-regional trade in energy. China’s Three Gorges Dam is an example of that. The second phase will be deeper cross border interconnection of national grids to bring on more renewable energy. Europe’s North Sea Offshore Grid Initiative is an example of this. The third and last phase will be interconnection of regions to allow regional interchange of surplus capacity. 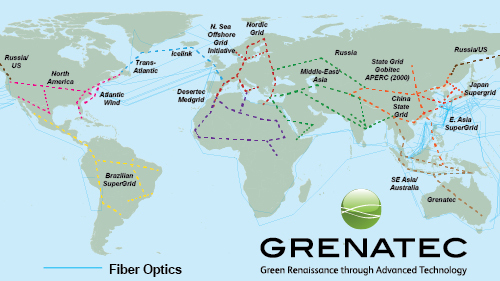 The now world-spanning grid of fiber optics cables is an example of this, much of which has only been built out in the last few decades. The comparison is between fiber optics, power lines and gas pipelines is apt. The reason is that units of energy — like packets of energy — are fungible. Given multi-destination conduits, markets will do the rest. A global infrastructure ‘Marshall Plan’ aimed at solving climatate change — particularly one that pays for itself through already-needed economic reforms — may well be the key to 21st Century prosperity. Australian Outback-generated ‘closed-cycle’ nuclear power offers a safe, climate-friendly solution to Asia’s energy needs. Instead of locating dozens of nuclear plants around Asia where they create huge accident, proliferation and terrorism risk, the entire industry should be concentrated at a secure, isolated, former military base in Australia’s isolated Outback. ‘Closed cycle’ means quarantining the entire nuclear chain — from uranium mining to spent fuel burial — at a single, isolated, secure, safeguarded place. When a nuclear accident occurs (an inevitability), the affected area can be evacuated, sealed and abandoned. This safeguards cities, a consideration neglected with Chernobyl and Fukushima. Outback Australia is nearly three quarters the size of China. It has a population density of less than three people per square kilometer. Parts of coastal China (such Fujian and Zhejiang), soon to be covered with dozens of nuclear plants have population densities of 500+ people per square kilometer. Even the most devastating commercial nuclear accident in the unsettled remoteness of Australia’s Outback would pose no risk to wider humanity or the global economy. The time is right for a mature discussion of ‘closed cycle,‘ Outback-generated nuclear power in Australia. Australian Prime Minister Tony Abbott, Foreign Minister Julie Bishop, Energy Minister Martin Ferguson and former Australian government nuclear research scientist Ziggy Switkowski all now sing praise of nuclear power. Serendipitously, the ideal Australian Outback location is now available: the uninhabited, underutilised, now-open-for-business Woomera Prohibited Area (WPA). If 50 nuclear reactors were all built at Woomera, they could singlehandedly catalyse a large-scale, Australian Outback ‘closed cycle’ nuclear industry. This would create the critical mass to attract additional proposed nuclear plants now being actively considered for highly-populated areas of Malaysia, Thailand, the Philippines, Vietnam and Singapore. All by itself, the WPA is larger than South Korea, Greece or the US state of Ohio. It’s also surrounded by the nearly equally empty — but much larger — South Australia. South Australia is twice the size of Thailand, three times the size of Japan, Vietnam or the Philippines. It’s seven-plus times larger than China’s Guangdong, Fujian or Shejiang provinces, where the bulk of China’s nuclear power plants will soon be built in highly-populated areas. When the next nuclear accident occurs (on historical trends, around 2030) , it will almost certainly occur in China (due to China’s aggressive nuclear capacity buildout). When it does, the the results will be devastating. In addition to creating a Chinese humanitarian disaster, it could also plunge the global economy into chaos given the pivotal role industrial China now plays in global supply chains. A nuclear accident on the scale of Fukushima or Chernobyl in China, South Korea or Southeast Asia would wreak havoc on the integrated global economy. Australian Outback ‘closed cycle’ nuclear power avoids this risk to populated areas. This represents an economic good with a net present value impossible-to-overstate. The ‘now open for business’ WPA is tailor-made for the job. In the WPA’s remote southwest Maralinga, nuclear weapons were tested in the late 1950s and early 1960s4 — indicating nuclear pedigree. With upstream uranium mining and downstream waste storage available in one place, the intermediate steps (enrichment and nuclear power) can easily be added — creating huge vertical (i.e. the nuclear production and waste-handling chain) and horizontal (electricity output) economies of scale. All by itself, the numbers it suggests singlehandedly creates the business case for a high-voltage direct current power link from Australia to China. Serendipitously, the global leader in HVDC technology — State Grid Corp. of China — now owns part of South Australian electricity distributor Electranet, perhaps with something along these lines in mind. Elsewhere in Asia, State Grid is operating and upgrading the Philippine electricity grid under a 25-year contract. Put into this larger context, ‘closed cycle’ nuclear energy from Australia’s Outback partially or wholly exported to China looks an ideal fit. 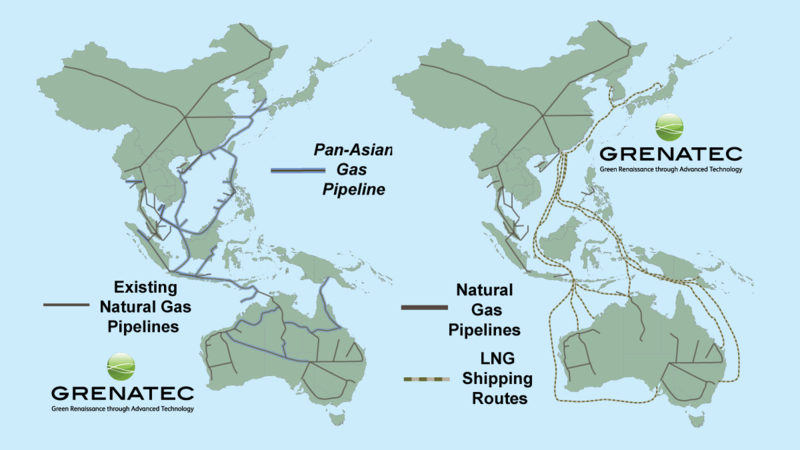 Such a Pan-Asian low-emission energy ‘Silk Road’ could be funded by China’s Asian Infrastructure Investment Bank which Australia reportedly now plans to join.5 With State Grid as primary contractor and Australia as nuclear host, the arrangement would utilize the ‘comparative advantage’ of both countries. Assuming multi-decade, trouble-free generation of ‘closed cycle’ nuclear at Woomera from, say, 2020-2060, the industry will have won sufficient public confidence to locate the subsequent generation of nuclear power plants closer to Asia’s cities — perhaps around 2060-2070 or so. In addition to safeguarding population areas from nuclear accident risk, closing the nuclear cycle eliminates the ‘nuclear miles’ that dangerous material must travel. This in turn eliminates proliferation and terrorism risk. In China uranium must now be imported, shipped to enrichment plants, shipped to nuclear plants, with waste then shipped for either reprocessing or burial. This all adds scope for mistakes, accidents or theft. Naturally, China has learned from nuclear technology and operational mistakes made elsewhere. But that offers limited assurance. China also learned from international experience in building high-speed rail system, but that didn’t prevent a tragic accident from happening in China with the new technology. Concentrating the nuclear industry in one place also better utilizes scarce global nuclear talent, significantly eroded by decades of controversy. The industry now faces deep skills shortages as young professionals sensibly avoid entering the industry. Creating a closed-cycle nuclear power industry on a former government military installation also ensures security and can eliminate nuclear proliferation and/or theft of nuclear materials that can be used to make bombs. China plans to build 150,00MW of nuclear capacity by 2050, adding nearly a third to existing global capacity. In Australia, even the worst, large-scale radiation release would need to travel multiples of the distances of Fukushima or Chernobyl’s radiation clouds to reach significantly-populated areas. In a ‘worst case’ nuclear accident scenario, the WPA can be evacuated, locked at the service town of Pimba out and abandoned for centuries — even millenia. Nowhere else in Asia offers this ultimate safeguard.